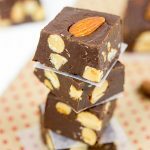 This Chocolate Peanut Butter Fudge is really easy to make…and it tastes like a homemade Reese’s Cup! I lost my ½-cup measuring cup. I have no idea how I did it, but it’s gone. I discovered it when I went to measure out the powdered sugar for this Chocolate Peanut Butter Fudge. I went to pick up my measuring up…and it wasn’t there. I checked the sink. Nope. I checked the drying rack. Nope. I even checked the sugar container. (I’ve been known to leave measuring cups in there.) Nope. It’s gone. I suspect it made a leap into the trash can and is now in the back of a trash truck somewhere. And that makes me sad. I have (had) this nifty little set of magnetic stackable measuring cups. And now that set is missing the ½-cup measure. But let’s talk about fudge. 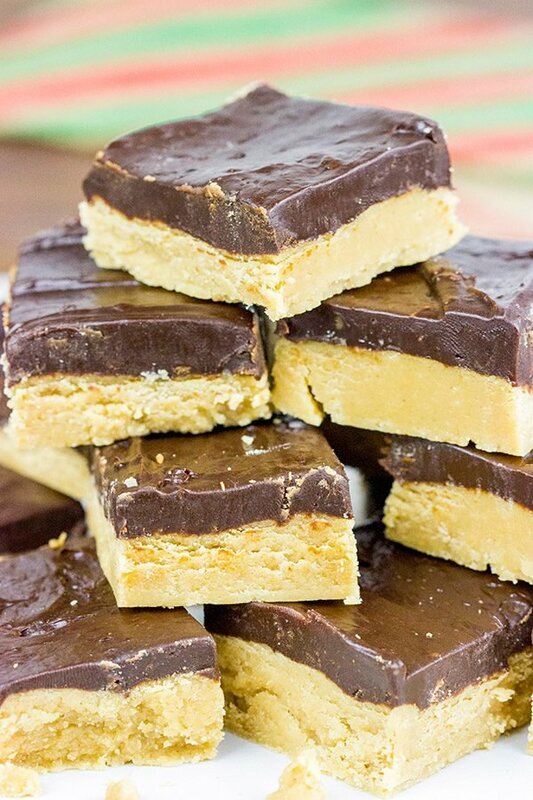 More specifically, Chocolate Peanut Butter Fudge. Chocolate makes everything better, right? Even the fact that you accidentally threw away a key part of your favorite measuring cup set. 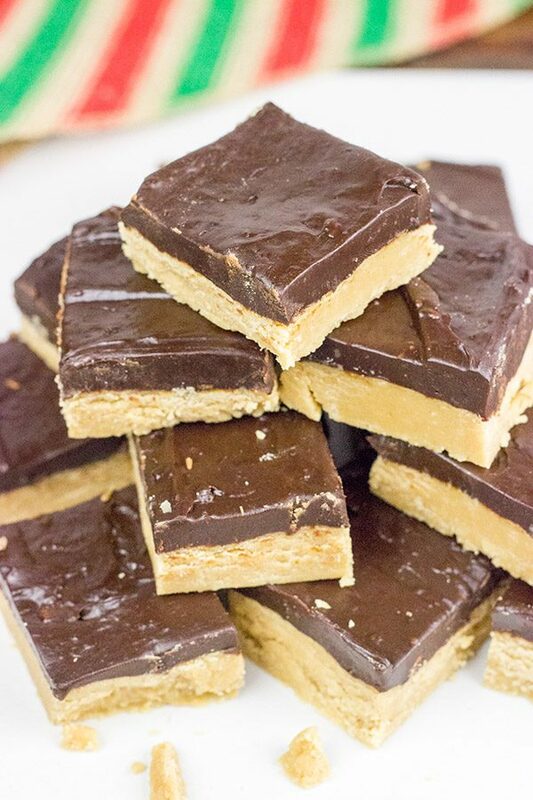 For this epic combination of flavors, I took my uncle’s peanut butter fudge recipe that he makes every year for the holidays and I added a layer of chocolate on top. I mean, it’s peanut butter and chocolate. They just go together moonshine and mason jars. I took 98% of this Chocolate Peanut Butter Fudge up to the curling club. (I ate 1% while cutting it, and Laura saved another 1% for her dinner.) Needless to say, I didn’t come home with any fudge. I pawned it all off on friends and teammates…although I’m not sure anyone really complained about it. I hope everyone has a great holiday weekend. Enjoy the time with your families. Enjoy watching the kids open their presents. 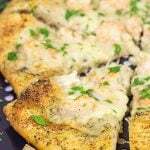 Enjoy some good food. And make sure to relax! I know I will be doing all of those things! 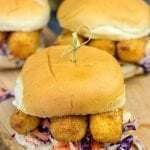 I’ll be back next week with a great New Year’s Day recipe. Cheers! 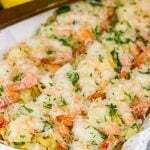 Line an 8” square baking pan with foil or parchment paper, leaving a 2” overhang on the sides; set aside. Using a medium saucepan, add sweetened condensed milk, butter, brown sugar and salt. Place over medium-low heat, stirring often, until smooth. Remove pan from heat and stir in peanut butter, vanilla extract and powdered sugar. Press mixture into prepared baking pan; set aside. Using a medium saucepan, add chocolate and sweetened condensed milk. Place over medium-low heat, stirring often, until smooth. 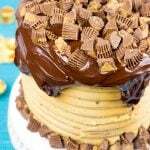 Pour chocolate mixture over peanut butter mixture, using a spatula to help spread evenly. Remove from pan; discard parchment/foil. 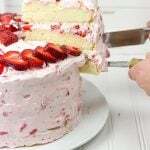 Slice into 36 pieces. I feel ya about the measuring cup. There has been more than one time that I’ve thrown out a kitchen utensil….it was often a vegetable peeler. I would peel veggies over a bag and then end up accidently throwing the peeler away when I placed it on the scraps. I’m more conscious of it now, though 😀 Fudge that is like Reese Cups? Um, yes please! I can understand why you didn’t bring any home after bring to your curling club. I bet this is amazing! Pinned, of course!. Maybe Santa will bring you a new measuring cup! You and your family have a wonderful Christmas, David! David, I know what Santa is bringing to you – ½-cup measuring cup! And you’re right, peanut butter and chocolate just go together. Somethimes I even sprinkle a little of chocolate over my peanut butter toast although some people might consider this a strange thing to do (Well, I don’t judge those who spread jam over peanut butter.) I also like Reese’s Cups so this fudge sounds right to me. I wouldn’t be able to limit myself to just 1% of this deliciousness. I would have definitely eaten 3,7% at once and then repeated (every few hours). You’re totally right! Santa did indeed bring me a new set of measuring cups, Ben. I just hope I can manage to hang onto these and not throw one away! 🙂 You know what? I actually don’t like jam + peanut butter. I’m strange like that. But I do like chocolate + peanut butter…and I gotta say that this fudge is amazing! I think I ate 3.9% right away in fact! I have lost things just like you lost you 1/2 cup measuring cup. I am not sure what happens to them. 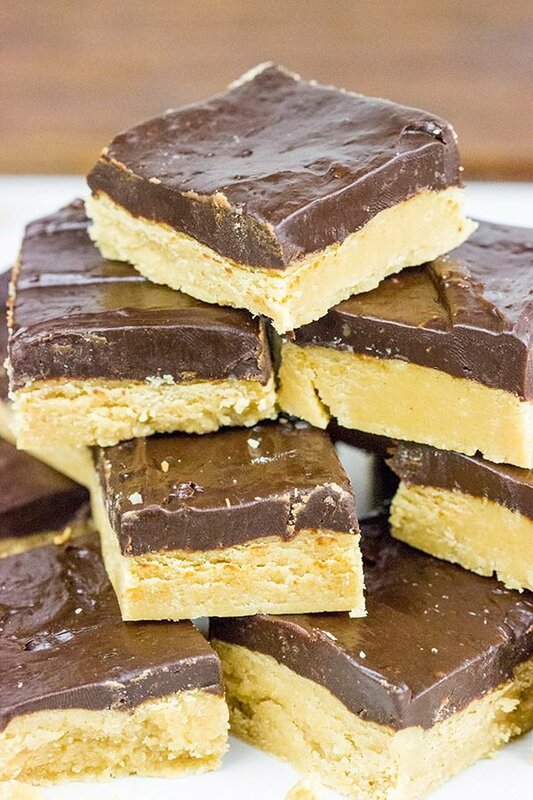 This chocolate peanut butter fudge sounds yummy and perfect for Santa. I wanted to stop by and wish you and your family a Merry Christmas. Dude – these would be purrrfect for Santa – especially for after all those runs across backyards he might end up having to do to try and get away from them little tykes! Lil Shashi once made PB fudge and it was to die for – but PB fudge with a layer of chocolate on top is heaven in cube form! Even though I cannot stand up on skates, am gonna have to move North and get on your curling club that way I can get on the Spiced’ taste testers club aka your curling team! Here’s hoping Santa replaces your lost measuring cup – Merriest of Merry Christmas’ to you, Laura and Robbie, David! Ho Ho Ho David! Your curling club is one lucky group! I’ve already made fudge so I’ll wait a little while before making this delicious combo. I can relate to your measuring cup incident. I have had my set of metal measuring cups since I was 15 and a couple of months ago the handle broke off the one cup measure. I have other sets, but I am still using the one with no handle! Have a wonderful, wonderful holiday!! Oh man, that curling club! I am literally in trouble in the summer when the curling club isn’t open. They are my constant source for willing taste-testers…and more than just taste-testers. 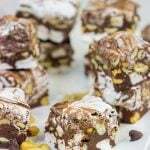 They are able to make whole plates of fudge disappear in about 2 minutes! 🙂 I hope you and Gary had a wonderful Christmas this year…and I hope you’re enjoying this bit of “down-time” before the new year starts up. Cheers, my Tennessee friends! Merry Christmas, David. I enjoy your blog, your writing, and look forward to your posts – this fudge one as much as the rest. May Santa bring you a new set of measuring cups. Oh yeah! It’s hard to beat a Reese’s cup…unless you create a homemade version. This fudge is amazing, Kevin! But be careful…it has the tendency to disappear very, very quickly. 🙂 Hope you and Dave are enjoying this down-time as we wrap up this year. Cheers, my friend! 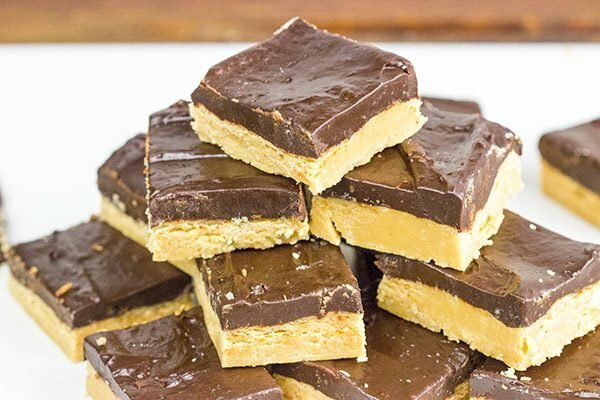 These Peanut Butter Fudge looks so yummy!! Just wanted to grab some!! Thanks so much, Sharmila! 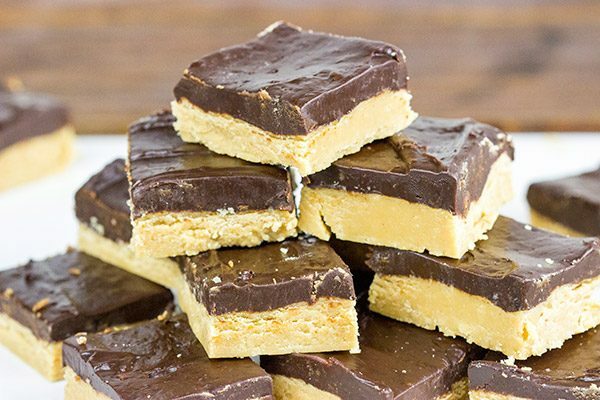 I love how easy this fudge is to make, and it’s the perfect sweet treat, too. Chocolate + peanut butter is such a tasty combination! 🙂 Happy New Year to you and your family!
? I mean how many of these can I eat before I explode. Hey Shellie! Thanks so much for your comment. I don’t use a calorie plugin on the site, but there are plenty of good websites out there that calculate calories based on ingredients. This fudge won’t be good for you! 🙂 But like everything, just eat a little bit in moderation, and you’ll be fine. It’s all about balance! Enjoy!